Malgorithm mark II is the long-awaited redesign of the world's first voltage-controlled bitcrusher, now available in high-resolution stereo with expanded controls. The bitcrusher is an essential tool in the Digital Modular Synthesist's arsenal. Its primary use is to bring foreign signals into aesthetic compliance with the synthesist's style. This is primarily done through the controlled reduction of two signal parameters, bit depth and sampling rate (labeled "Nyquist"). Bit depth reduction effectively reduces the dynamic range of the signal by eliminating the least significant bits from the audio, destroying the finer details and gradually converting the waveform into a series of "staircases", ultimately arriving at a square wave. Ordinary bitcrushers process the bit depth in integer steps, resulting in a choppy, discrete control respones. Malgorithm features continuous, non-integer bit depth reduction, a modular first. By eliminating the steps from the Bit Depth control sweep, the user may now fully enjoy the full depth of dynamic transformation that this unique process offers, under manual or voltage control. The Sampling Rate control reduces the speed of the digital audio system within Malgorithm to cause a foldover of input frequencies exceeding one-half of the sampling frequency (the Nyquist limit). This sounds like a strange combination of filtering and ring modulation, with bidirectional foldover (forward from zero Hertz) occurring at extreme settings. 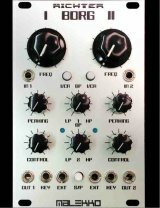 The extreme spectral manipulation offered by this process responds remarkably well to audio-rate control modulation, offering access to a unique class of new sounds left unexplored by conventional synthesis. After these two processes are complete, the signal optionally passes through a digital waveshaper. Controlled by four brightly illuminated colored buttons, the signal is subjected to four rounds of digital destruction. Fuzzy octave-up weirdness, self-oscillating logic disasters, and harmonically rich waveform crumpling are available in 256 possible combinations. 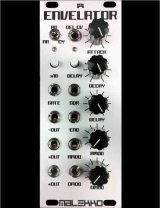 A voltage-controllable wet/dry mix knob is provided to balance this destroyed signal with the clean input sound, and the input gain itself is voltage-controllable to act as an auxiliary VCA, and to achieve dynamic wavefolder effects under certain settings. Under deeper waveshaper settings, the data from the left/right stereo channels crosses over and affects the opposite channel, leading to bizarre effects dependent on the correlation of the two channels. Malgorithm now features full stereo I/O to faciliate insertion into your stereo mix bus. Bit depth reduction control is now continuous. No steps. Get in-between the bits.